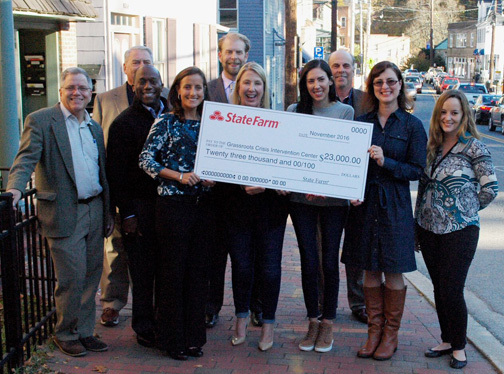 One of the 2016 highlights of community support came when Grassroots received a donation of $23,208 from State Farm Insurance Company to provide help for Ellicott City. Individual agents also made contributions totaling another $4,250. The gifts were made in recognition of Grassroots’ support of flood relief efforts in Ellicott City, where State Farm has an office on Main Street. Local agents also donated $5,100 to the Ellicott City Partnership. On hand for the check presentation were (front row, from l.) Delegate Eric Ebersole, State Farm Vice President Christopher Gude, agent Kate Merten, agent Elaine Gossage, agent Andrea Magers, Grassroots Business Manager Anna Katz and Mobile Crisis Team staff member Sarah McCoy, (back row, from l.) agent Ron Regan, Ellicott City Partnership Vice President Tom Coale, and agent Fred Gossage.